The World Poker Tour and all those who call the shots must have been really happy as the WPT Doyle Brunson Five Diamond World Poker Classic field played down to its final table and saw the names remaining. Just missing out on the TV table were Jon Aguiar, Jason Somerville, Yevgeniy Timoshenko, Freddy Deeb, Greg Mueller, Andrew Robl, and Scott Clements. They all crashed out on the final two tables but Antonio Esfandiari, Andrew Lichtenberger, and Shawn Buchanan will once again see themselves on the small screen. 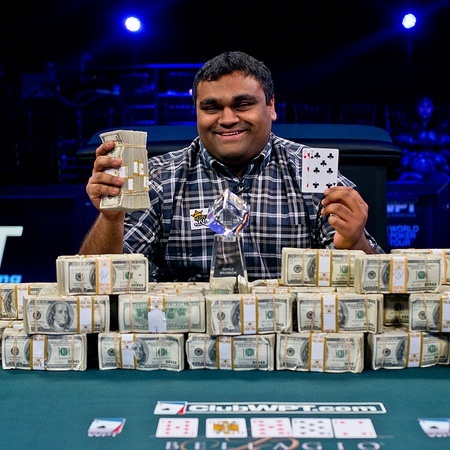 Ravi Raghavan, recently of the Borgata Fall Open Main Event final table, was the last player standing as he knocked out Buchanan in 2nd place to increase his bankroll by nearly $1.3 million. Thanks to some structure tweaking and reasonable PR by the Bellagio staff, there was far less complaining about this year’s Five Diamond event as last year. Baby steps. Maria Ho Joins Heartland Poker Tour Broadcast Team for Season 9 – Good move by HPT because everybody loves Maria Ho. Those poor fanboy souls hiding in Iowa and Minnesota are going to lose their minds when she shows up in the their local poker room. 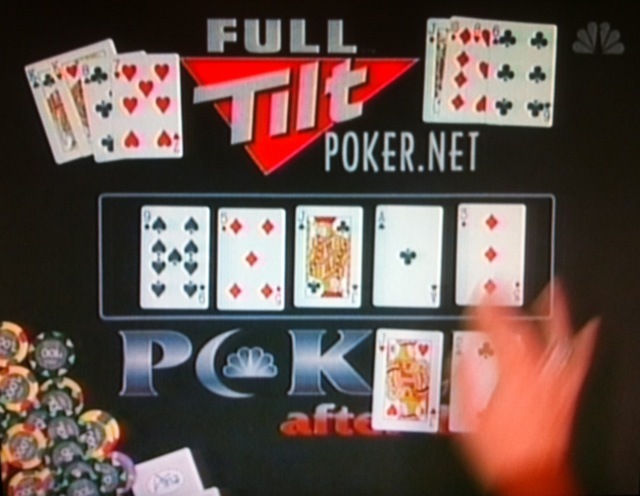 ‘Isildur1’ Bests Dwan in $400k HU Match – Full Tilt Poker is back which means we now have the platform to witness huge HU matches between the biggest names in poker. 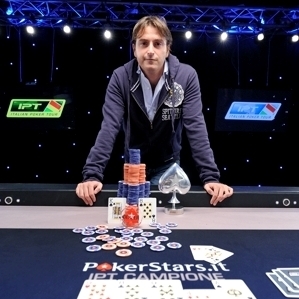 This weekend it was Viktor Blom slicing off a piece of Tom Dwan. 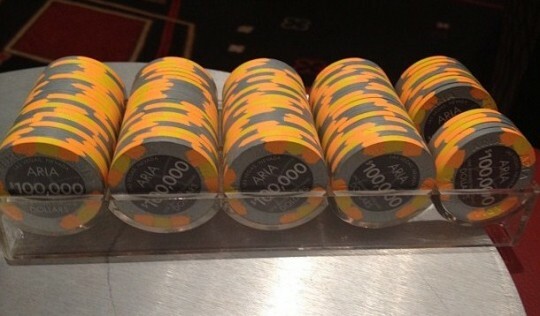 Casino operators gearing up for online poker – Things are starting to move right along with online poker in Nevada. I’m still skeptical about how successful it will be but it’s better than moving backwards. Women Business Execs Learn When to Hold and Fold ‘Em – Presented without comment, because I have no idea what to think about this article on ABCNews. I think I will wait until Amy Calistri straightens me out. The Micros: The Lost Episode – They’re back! At least for one episode but tell me you didn’t miss the opening tune. Seems this episode has been steeping for awhile during the PokerStars/Full Tilt negotiations but it’s now ready for your viewing pleasure. It will be “limited” to 48 players total and played out in a shootout format, with $5 million guaranteed to first place. Which means that if this is a true guarantee and not just a projected prize if all 48 slots fill, mean that you would need 20 players minimum just to break even (sans rake, and only if it’s a winner-take-all tournament). The IPPA is not…well known, at least certainly not in the US. Their website is equally sparse in terms of action information, but they may be trying to put themselves on the map with a tournament of this size. There are satellites running in at least two confirmed places, Monte Carlo (naturally) and The Bicycle Casino in beautiful Bell Gardens, CA. How does one even satellite into this tournament? Think the step tournaments online, except the stakes are much, much higher. 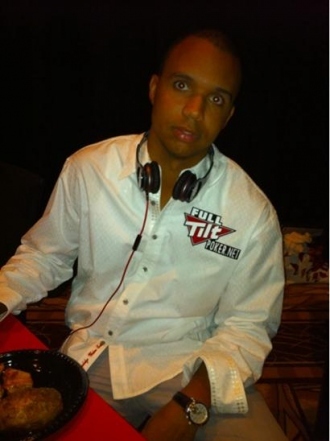 The Bike already ran $100, $1k and $9k satellites during the Legends of Poker tournament series, but their site does not have any results for the $1k and $9k satellites so its unknown how many takers they got. It will be a televised event, but with the field the way it is so far the IPPA and/or Monte Carlo hopefully will be pushing hard to get some whales in the game, or it may deter other pros from throwing their hat in the ring. Still, the organizers have to cover their “overlay” first, which will be no small feat when pros are being asked to drop $250,000 in one go into a shark-filled tank. If this tournament happens it certainly will be an interesting sight, not just for the prize pool but the revival of a lingering question regarding how we keep score in poker. Already there has been talk of what “counts” on the all-time money list, so if someone like Ivey did win the $5 million for what amounts to a 48-person (or less) SnG it could lead to some gripping from a few pros (quite possibly including the #2 man on that list…who could become a distant #2 or 3 after this tournament). 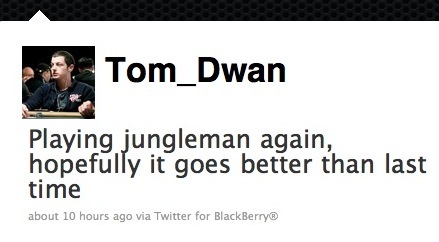 @Tom_Dwan — the real durrrr is now tweeting, and turns out he’s pretty good at keepin’ it real in 140 characters or less. 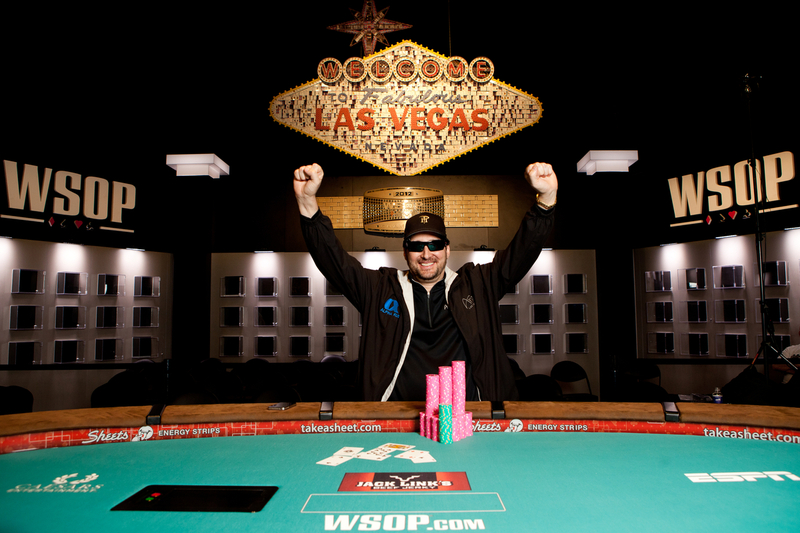 @JeffreyPollack — the former WSOP commish has resurfaced on the internet with warm wishes. 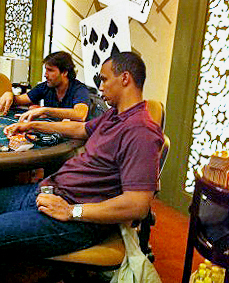 Good to see him around WSOP parts again, albeit slightly removed. @RioVegas — if the suits @Harrahs have done one thing right, it’s hire a good social media dude for The Rio who has proven surprisingly responsive and capable of putting smart tweeters in touch with the right people when necessary. @TheRealAsianSpa — not sure if this is an alterego to the most vitriolic (but informed) poker hater on twitter or what … but either way, apparently @AsianSpa has taken the ways of @SamChauhan’s @PositiveReport to heart and can’t help but look at everything #WSOP as benefitting from a happy ending. @GamingCounsel — was hoping others might not notice the Canadian attorney who’s proven a great source on the latest legal developments in the gambling world … but now my competitive colleagues all follow him, so if you care about poker laws, you should, too. @TheGroupie — she’s just a poker fangirl who’s not in Vegas, but met this 20something poker-playing figure-skater PhD @riovegas just the other week, and for some reason couldn’t stop staring at her tweets. 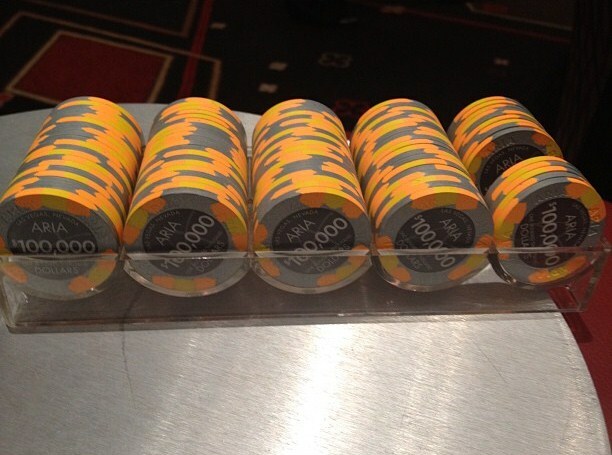 @OskarGarcia — the AP’s Vegas-based reporter covering gaming is putting in some extra time at the WSOP. @PUNTE — Josh Zerkle is a professional sports and social media-y kinda guy @WithLeather, and is keeping his WSOP micro-thoughts and observations here. There … all those should do you extra-well. Feel free to leave any others @’s you think Pokeratizens and assorted poker fans might not wanna be missing this July in the comments.